Do not operate the push-button ignition switch while driving the vehicle except in an emergency. (The engine will stop when the ignition switch is pushed 3 consecutive times in quick succession or the ignition switch is pushed and held for more than 2 seconds.) If the engine stops while the vehicle is being driven, this could lead to a crash and serious injury. once to change to ACC. two times to change to ON. three times to return to OFF. The ignition switch will automatically return to the LOCK position when any door is either opened or closed with the switch in the OFF position. The ignition lock is designed so that the ignition switch position cannot be switched to OFF until the shift lever is moved to the P (Park) position or N (Neutral) position (MT). Move the shift lever into the P (Park) position or N (Neutral) position (MT). Push the ignition switch. The ignition switch position will change to the ON position. Push the ignition switch again to the OFF position. The shift lever can be moved from the P (Park) position if the ignition switch is in the ON position and the brake pedal is depressed. 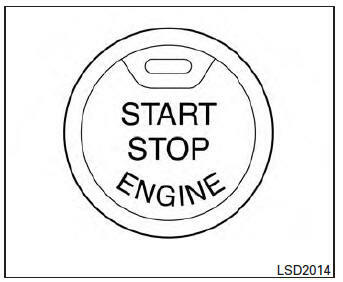 If the battery of the vehicle is discharged, the push-button ignition switch cannot be moved from the LOCK position. Some indicators and warnings for operation are displayed in the meter. See “Warning/indicator lights and audible reminders” in the “Instruments and controls” section.